Whether pureeing nuts for homemade pesto or simply chopping onion for tuna salad, this Chef's Chopper by KitchenAid is an essential tool in any kitchen. The large, 3-cup capacity work bowl tackles most recipes while the one-touch pulse control offers precision chopping. The chrome design looks great in retro and modern kitchens alike. Other features include reverse spiral cutting action and an easy-to-clean design. Imported. 10Hx7Wx7D". My husband and I LOVE this chopper! We didn't own one before but will never go without again! It's a little noisey but then, I never had one before so this one might be quieter. I read the reviews here, a complaint really, about stuff coming out the top. We put our hand on the top like you do a blender and it comes out onto your hand. No biggy! Wipe it off! You need to put your hand on the top of it anyway only so the chopper doesn't fly away! IT'S SO PoWeRfuL! My husband makes his wonderful dip in it all the time now! It cuts carrots, peppers, spinach, onions,ect....We tried alot of stuff and couldn't beleive it! If you want it chopped alittle, just pulse it a couple of times....you want it pulverized to tiny little pieces, hold the button down a couple more seconds for long pulses....NICE product here. Update: after about a month of using it the chopper all-of-a-sudden died on me! I was rather disappointed, however KitchenAid has a "no-hassle Warranty." I called their toll-free number and as per their warranty, they will mail me a brand-new chopper and send me a pre-paid calltag at their expense. (All I had to do was provide them with my address and the serial number, no credit card was needed and they will send me the new replacement first, without receiving the defective unit first.) I have not received the replacement yet, however I am very pleased with their warranty process so far (although I did have to wait on hold for more than 10 minutes). 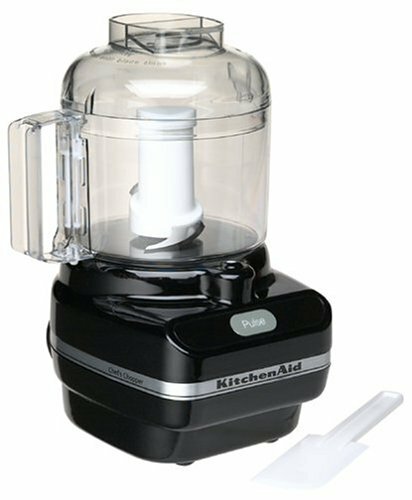 I purchased the KitchenAid chef series mini chopper in onyx black and it's proven to be one of the most useful small appliances I've gotten for my kitchen in ages. It's the perfect size because 3 cups can hold a lot (much more than you may think) but it's not big and bulky like one of those outdated food processors (that are a monster to try to get inside the dishwasher). I got this mainly for 2 tasks that are otherwise time consuming, chopping onions and making fresh bread crumbs and it does the jobs to the letter. I cannot believe how quick and powerful it minces the onions because within a blink of a eye it pulverizes them and before you know it you're done. I can't begin to tell you how much time this has saved me. I've also used the mini chopper for parsley, peppercorns and garlic and it also chops all of these ingredients precisely and evenly (and there's never any big or uneven chunks). Before I got this I made the awful mistake of buying a very expensive and incredibly useless chopper from Bamburger's. I barely got 1 use out of it before it just conked out. That is not the case with the KitchenAid. You will have it for years and years because it is incredibly powerful and made of high quality parts that know how to take a beating. As I mentioned, I really like this chopper because it dices and chops everything so evenly. That is because it has 2 blades of altering sizes that grabs the ingredients from all directions and angles inside the bowl. And, this truly is a kitchen appliance that will save you time because you'll get the job done and you won't have to worry about cleanup nor will you have to worry about any residual mess from the actual task, either. Besides the power base, this includes the clear bowl, the lid, the blade, a detailed instructional booklet and even a rubber spatula (that's useful for other tasks as well). And everything (besides the base, of course) is dishwasher safe. Don't you hate it when those dimwits say in commercials, "but it's so easy to wash by hand..." Yeah, and so is a Donna Karen sweater. This is not 1885, I'll be damned if I'm gonna wash anything by hand. This item is also incredibly easy to use. I've had many choppers and food processors that are a huge pain to line up and close. This has little indentations on the base, on the lid and on the bowl to let you know where to line everything up and it all clicks into place easily with a slight locking sound. I purchased mine in onyx black (for some reason this review is defaulting to the chrome colored item, that is not the one that I got). Onyx black is actually a color that some distributors came up with, it is not a color that KithenAid uses. The true color is black. It is a shiny metallic black that will look great in any kitchen. If you're interested in getting this I strongly recommend getting it from Amazon. You can find it for a few bucks less (on QVC) however with the shipping and sales tax you'll pay more. Also I do not know of any other e-commerce site that is as quick or accommodating as far as returns are concerned besides Amazon (although QVC is pretty close). (BTW, speaking of QVC, don't you just love that KitchenAid lady that comes on every couple of weeks for on-air demonstrations? She's so cute, she reminds me of my granny.) Also if the Amazon Web site states that it's out-of-stock, don't worry because they're constantly updating their inventory so I'd still order from them. It's no coincidence that this mini chopper is a top-rated America's Test Kitchen pick. If you're familiar with ATK then I don't need to tell you how picky and quality-conscience they are. So for this item to be among the small selection of other kitchen appliances that they use is very reassuring for a little at-home cook like me. I've been wanting a small processor like this for a long time. I purchased this chopper to make baby food. It is small and very easy to accomodate in your kitchen. It has a storage space in the bottom to place the cord once you are done using it, although I don't use it because it is pretty tight and the cord ends up bent at unnatural angles. It gives me the impression that it would end up ruining the cord, but the again, maybe it's just me. My baby is over 8 months now and she's able to eat food with more consistency, which is good because this chopper will NOT make smooth puree for younger babies...no matter how much you try!. I give it only three stars because it is pretty tricky to get it started. You have to have every single piece E-X-A-C-T-L-Y in place or it won't start. The jar's handle has to be facing the start button and the top has to click exactly in place and the blades have to be adjusted in place or it will simply not start. It is also a bit difficult to get all the food out without the spatula, which I do realize that is the reason why they included it, but for a busy mother with a hungry-screaming baby in the background that is trying to get things done fast...it could be a little frustrating. The top also has a couple of features to add liquids to the food while chopping, which sounds handy except for the fact that it also allows the food to go flying through there if you are not careful. You get what you pay for. Not bad but it is certainly not the best I've had either. If you want to mince onion this machine is just fine, however, chopping is outside of its range.